These are just averages, of course, and there is great variation in dehorning practices even within the same production segment. For example, cow-calf producers in the western U. S. are far less likely to use saws, Barnes or keystone dehorners (14%) than cow-calf producers in the eastern U.S. (59%).2 But these numbers do provide a broad look at the practice of dehorning in general, and highlight areas where improvements can be made, especially in the areas of pain relief and early-age disbudding. When it comes to dehorning, what improvements do you think are needed? The HSUS report also expresses concern that dehorning is “commonly performed without pain relief” and that “the majority of [beef production] facilities dehorned calves only after the horns began growing.” These concerns are shared by many within the industry. Organizations such as the American Veterinary Medical Association (AVMA) advocate early-age disbudding as well as the use of local anesthetic during dehorning. Regarding the use of polled cattle, the vast majority of dairy cattle in the United States, and a significant percentage of beef cattle, is not polled. For owners of these herds, dehorning remains an essential management practice for both human and animal safety. Regarding HSUS’ claims about caustic paste, we are unaware of any paste products labeled for “multiple applications.” The label for Dr. Naylor Dehorning Paste, for example, states, “Apply Dehorning Paste once only [our emphasis] over horn button and roughened ring around horn button.” A protective ring of petroleum jelly or Udder Balm will confine paste to the paste application area, while isolating the calf for several hours will prevent paste from getting on the dam or other animals. Contrary to the HSUS, we see dehorning as a necessary management practice for the safety of calves and their human handlers. We also believe the industry can and should be doing a better job of moving closer to the recommendations advocated by the AVMA and others. From an animal welfare perspective, as well as from economic and public relations perspectives, dairy and beef producers should give strong consideration to the practice of early-age disbudding with caustic paste, which has been shown to be less painful than other methods. What do you think of the Humane Society’s report? Mercy For Animals (MFA) has released another undercover video, this one documenting animal cruelty by some workers at the E6 Cattle Company, a calf raising operation in Hart, TX. The abuses have been rightly condemned by company owners, animal welfare activists, and the American Veterinary Medical Association (AVMA), which called the beatings “barbaric, inhumane and unacceptable.” The workers were fired. The video also depicts workers burning horn buds off calves with a hot-iron and, in one scene, a branding iron. The acts of cruelty shown are truly repugnant and definitely not typical of responsible calf raising facilities or any livestock operation for that matter. But the dehorning procedures depicted are standard management practices on many farms, and are not, in themselves, gratuitously cruel. By including these scenes in its compilation of abuses, MFA has, unfortunately, lumped dehorning into the same “horrifying” category as euthanizing calves with hammers and pickaxes. The majority of dairy producers and many beef producers practice hot-iron disbudding, which is certainly preferable to dehorning at later stages with more invasive methods. That said, hot-iron dehorning is painful, and producers should use analgesia and/or sedation whenever possible. A more humane alternative is caustic paste disbudding, which has been shown to be less painful than hot-iron dehorning. The non-sedated, non-medicated calf in this video, for example, barely reacts when dehorning paste is applied. Do you think dehorning should have been included in Mercy For Animal’s undercover video of abuses at E6 Cattle Company? Vickers, K.J., et al. 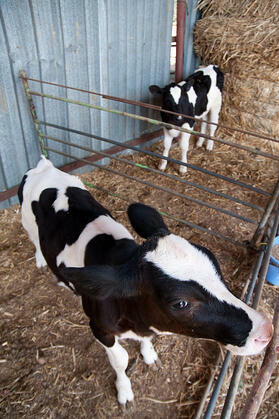 Calf Response to Caustic Paste and Hot-Iron Dehorning Using Sedation With and Without Local Anesthetic. J. Dairy Sci. 88: 1454-1459, 2005. Last November, the European Commission’s Directorate-General for Health and Consumers, Animal Health and Welfare Directorate released a study on alternatives to cattle dehorning in the European Union. It provides a fascinating glimpse into food animal management practices overseas, highlighting some surprising similarities and differences between operations in Europe and here in the U.S.
Raising polled animals is an alternative explored in the study. Currently, the prevalence of polled cattle in Europe is very low, less than one percent for dairy and less than four percent for beef.1 European farmers have indicate they may be interested in polled bulls with high genetic merit, and the development of breeding programs for Holstein and Charolais cattle are underway. Some negative traits have appeared in German Fleckvieh breeding programs, and more research is needed to determine if these are linked to the polled gene. What do you find most and least surprising about dehorning practices in Europe? AVMA Backgrounder: Welfare Implications of the Dehorning and Disbudding of Cattle. January 28, 2010. Infection is a possible complication with any dehorning method, but is most often associated with invasive procedures that expose the sinus cavity and/or cause blood loss. The use of knives, tubes, Barnes (gouge) dehorners, keystone (guillotine) dehorners, obstetrical wire and saws all increase the risk of infection during dehorning. Exposed sinuses attract disease-carrying flies, and numerous bacteria can be involved.1 The presence of flies or maggots in sinus cavities will be obvious, but other, more subtle signs of sinusitis can include lack of appetite, fever, nasal discharge and abnormal head carriage.1 Such infections can show up immediately after dehorning or even months later, after the wounds have healed. Early-age disbudding with caustic paste or hot-iron, which do not expose the sinus cavities or cause blood loss, reduces the risk of BLV infection associated with dehorning. Clean dehorning instruments with disinfectant between use on animals. Make sure dehorning instruments are kept sharp. Try to cleanly cut bone tissue rather than crushing it, as crushed tissue may be more vulnerable to infection. Dehorn outside of fly season or use fly deterrent. Treat wounds with blood coagulant powder. Monitor mechanically dehorned animals for signs of infection, such as lack of appetite, fever, abnormal head carriage and foul breath. If you see these signs, contact your veterinarian for a definitive diagnosis and treatment. How do you control dehorning-associated infection in your operation? The Merck Veterinary Manual, 9th Edition, 2011. Marei-Liesse G. Lassauzet, et al. Effect of Brucellosis Vaccination and Dehorning on Transmission of Bovine Leukemia Virus in Heifers in a California Dairy. Can J Vet Res 1990; 54: 184-189. Welfare Implications of the Dehorning and Disbudding of Cattle. American Veterinary Medical Association’s Animal Welfare Division. January 28, 2010. “Ethical” is a word tossed around a lot lately in the animal welfare debate. According to the Merriam-Webster Dictionary, ethical can be defined as, “relating to ethics [the discipline of dealing with what is good or bad]”, “involving or expressing moral approval or disapproval” and “conforming to accepted standards of conduct”. Let’s start with the issue of dehorning as “good” or “bad”. Some say “bad”, because it’s painful for the animal. However, vaccination is also a painful procedure. Few would argue that vaccination is “bad”, because it ultimately confers the benefit of disease prevention. Does not dehorning also confer the benefit of preventing injuries from horned herd-mates? According to the American Veterinary Medical Association, dehorned cattle are less likely to suffer bruising, inflict injury to the udders, flanks or eyes of other cattle, or injure horses, dogs and handlers.1 Ultimately, dehorning benefits not only the animal that undergoes the procedure, but also all the other animals and humans it encounters throughout its life. The issue, then, comes down to the ethics of the dehorning method itself. There are several ways to dehorn cattle, ranging from caustic paste disbudding in young calves to hand saw dehorning in mature animals. The pain inflicted on the animal, and the risk of injury posed by each of these methods, vary widely. Surveys tell us most dairy farmers use a hot-iron to disbud calves,2 while most cow-calf producers use Barnes or Guillotine dehorners.3 These methods would therefore seem to fit the definition of ethical as conforming to accepted standards of conduct. But just because a practice is widely accepted does not necessarily make it morally acceptable. And, accepted standards of conduct can change over time as we’re witnessing now in the animal welfare debate. Is it ethical to dehorn animals with saws, tubes, knives, Barnes and other tools when other less painful, equally effective methods exist? Is it ethical to perform dehorning – or any potentially painful animal management practices – without the use of pain relievers or sedatives? What are your views of the ethics of dehorning? Responses are still coming in, but so far, it looks like the majority believe pain relief should be provided for reasons ranging from, “We have the responsibility to treat production animals as co-existent beings” (45%) to “It can make the procedure easier” (1%). Respondents arguing against pain relief cite the risk of cattle eventually having “more rights than a human”, or veterinarians raising the price of their services. We realize this survey doesn’t purport to represent a statistically significant sample of dairy producer attitudes toward dehorning and pain control. But we are nonetheless surprised at the disconnect between this online questionnaire and a Colorado State University study of 113 dairies showing only 12% of producers used anesthesia during dehorning, and less than two percent used analgesia (Fulwider, W.K., et al. Survey of Dairy Management Practices on 113 North Central and Northeastern United States Dairies. J. Dairy Sci. 2008. 91:1686-1692). What do you think accounts for discrepancy? Is it possible producer attitudes have undergone a dramatic shift toward dehorning and pain control in just a few short years? Are attitudes simply not a reliable indicator of actual management practices? One thing is certain: We wouldn’t even be having this discussion a generation ago. Attitudes toward food animal production are slowly but inexorably changing among producers and consumers alike. Some veterinarians believe analgesia will be required for dehorning, castration and other management practices within the next five to 10 years.